Life is moving so fast right now, I just can't seem to squeeze out enough hours in the day to get everything done that I want to! 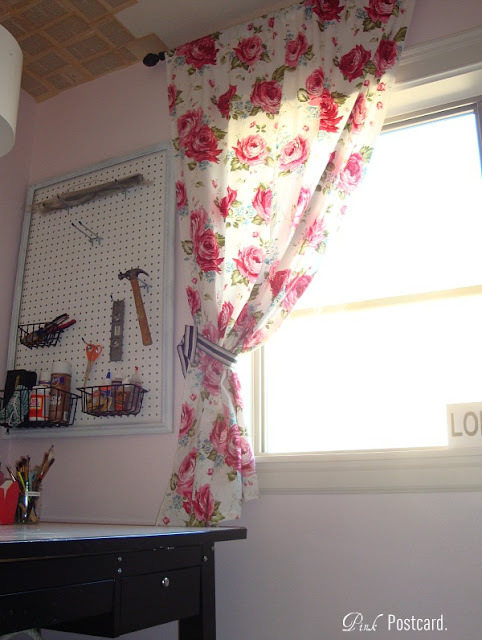 I really didn't get anything done yesterday, but here's another element to the craft room that I am so happy with. 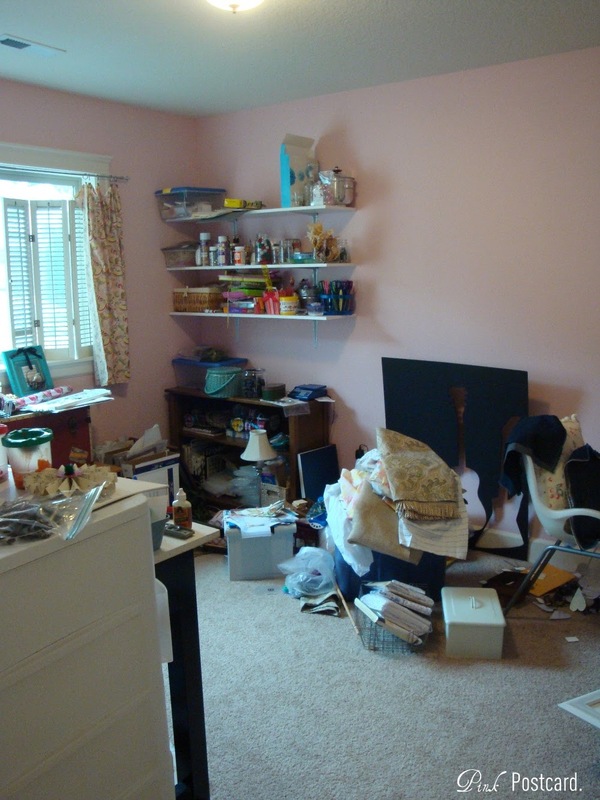 Buh-bye dump room, hello creative inspiration room! 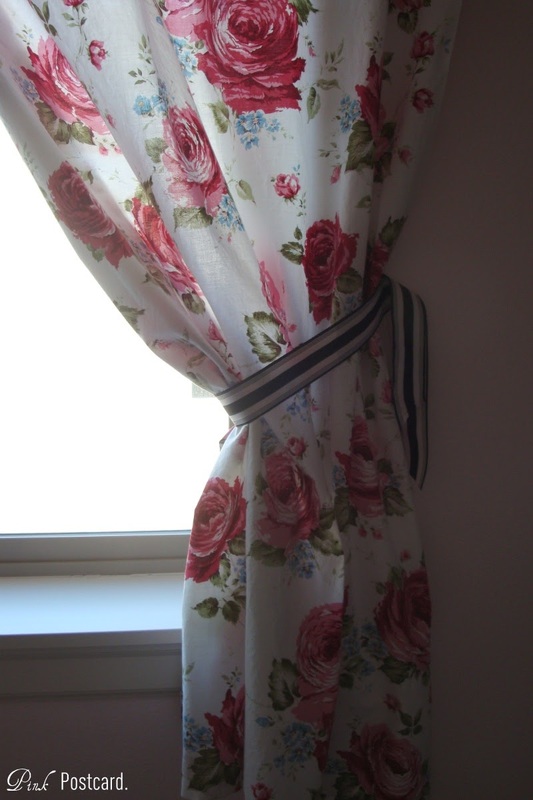 Here's the curtains I made- I moved the curtain rod we had over our master bath tub into here. The one I had before was too flimsy and cheap. Plus, I liked that it added another accent of black. I added the black and white Frenchy ribbon as tiebacks. 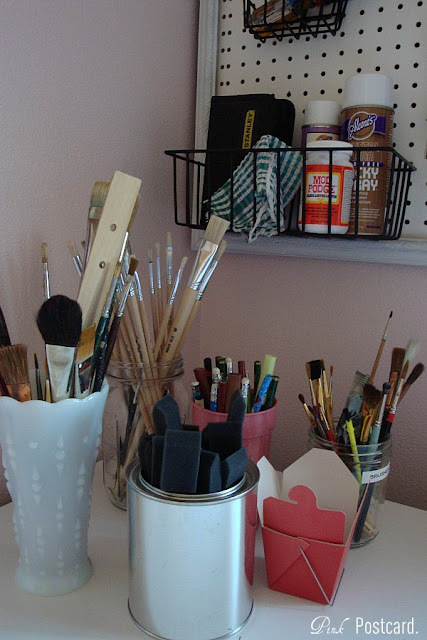 I'm still on the hunt for more milk glass storage- you can see how I'm using it here for paintbrushes. The clear mason jars are great cheap storage too. My little red takeout box is holding saved fortunes for a project I am going to do once the room is in working order! The little glimpse of the pegboard. 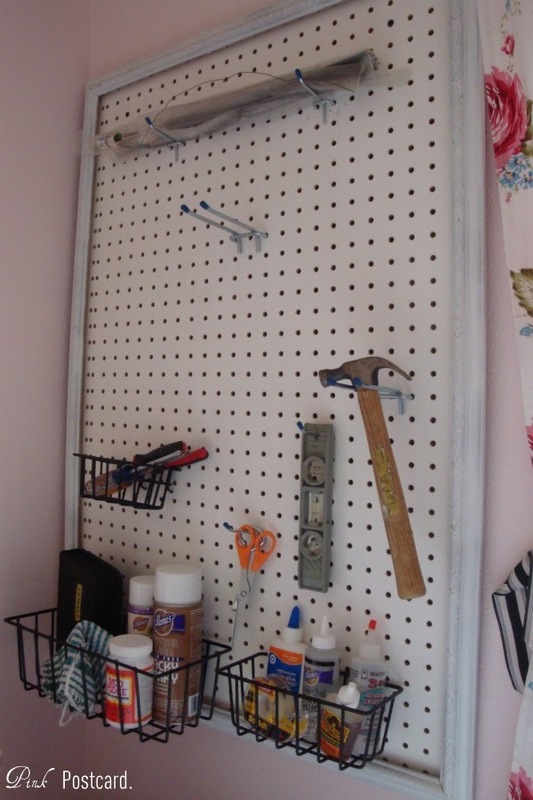 I have literally been fantasizing about this pegboard project for months!! Seriously, I have been so anxious to get this done! Here I am, in all of my evening comfort wear. We had a large framed print above our tub that I was done using, and I thought if I glued the pegboard to the frame, it would make it a whole lot prettier than just the board hanging there. 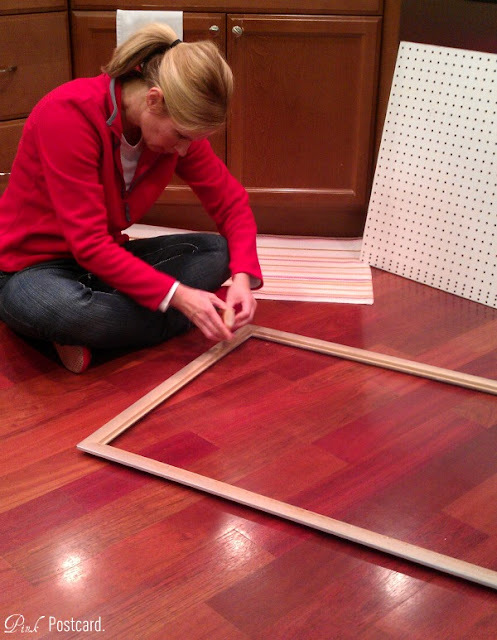 I spray painted the frame white and let it dry out before the next part. 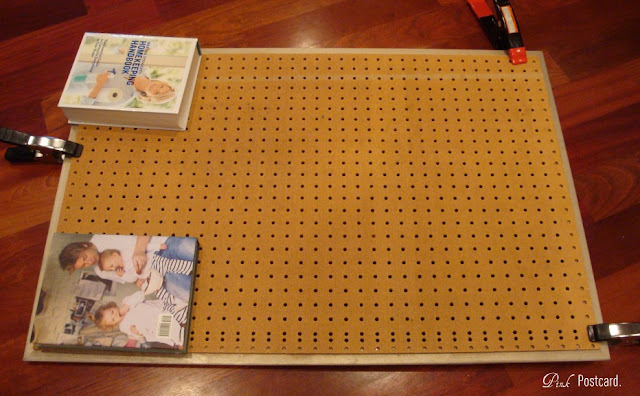 When I bought the pegboard at the bargain shed, the guys behind the counter asked me what I was making. I told them I was making a tool holder for my craft room. They nodded, and were slightly intrigued. Emphasis on slightly. I was also buying the dowels for my gun rack / ribbon organizer. So I told them about that, and they got big grins on their faces and thought that was pretty cool. The emotions it brings out in people. LOL! I let it dry overnight, and then put some spacers behind the pegboard so I could use my tool hangers. I still have a LOT more room for hooks and tools, but for now, I'm so happy the stuff is off my TABLE!! and the hooks cost me about $12. You may have also noticed a HUGE project I am undertaking on my ceiling. I am wallpapering my ceiling with book pages! I have loved this idea and thought this would be the perfect place to try it. So far I've used one paperback, and I just bought 3 more from the thrift store. A total of $4 for my "fifth wall" treatment. Hoping to have it done by the end of the week! I had the opportunity today to help a friend restyle their great room area. I will post before and after pictures on that project in the near future as well. We had so much fun! 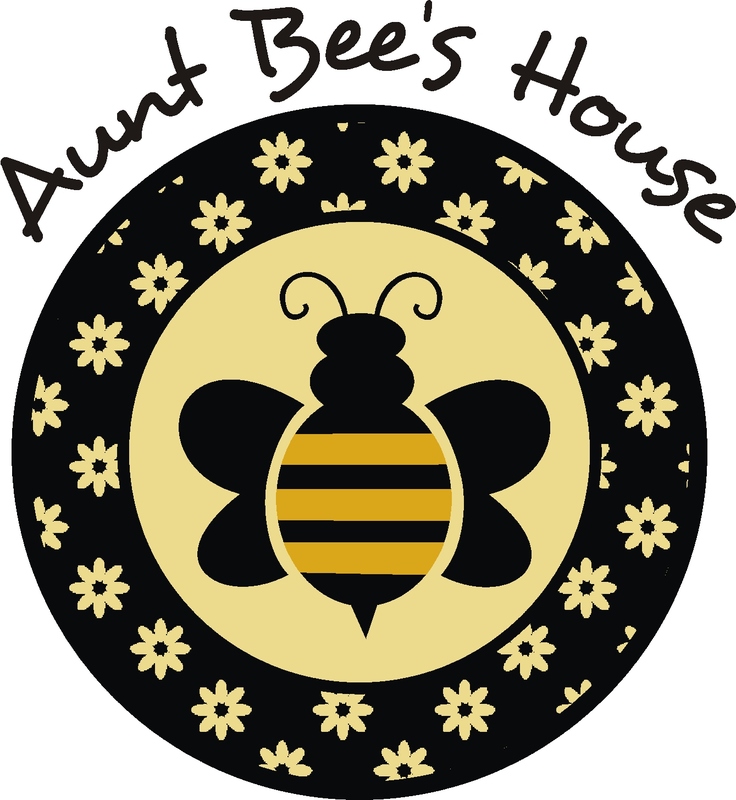 See you tomorrow for Transformations and Treasures! You are making big progress on your craft room! It looks like it is really coming together. Loved the new curtain you made. That first photo looks like it came right out of the pages of a magazine - so pretty! I love the idea of the book pages for your fifth wall. I'm swooning over those curtains!!! Looking good. I can't wait to see that ceiling! !